Our guest today is Bimba Landmann, an Italian author and illustrator whose books include I Am Marc Chagall, In Search of the Little Prince (published Fall 2014), and the recently-released Just for Today. 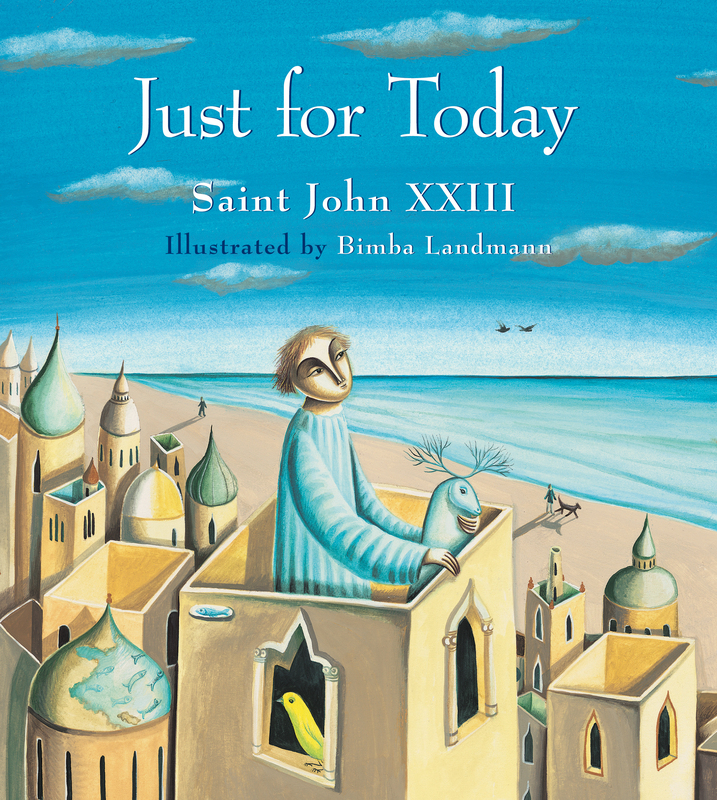 In Just for Today, Landmann illustrates the ten simple rules for daily living authored by Saint John XXIII. For this edition of Five Questions, Landmann was kind enough to write — in a non-native language, no less — about the inner vision she brought to life in her new book. What inspired you to illustrate and publish Just for Today? Why did you think Just for Today would make a good book for children? Well, I’m just hoping it is a good book for children! I hope through my book children will explore more deeply their inner world, building inside and outside a better world. I hope my drawings prompt them to always follow their “magical sight” in the world, and keep their “pure eyes,” as long as possible. There is a blue deer with antlers that appears throughout Just for Today. What is the significance or symbolism of this deer? The use of cool colors (blues and greens) is striking and beautiful in Just for Today. Why did you choose this color scheme? Of course, my favorite color is blue. I cannot get tired of it, not even after all these years! Every day I find something interesting in every nuance, and I like it so much when the sky becomes blue-blueblack as the night, or “bluestorm” with the wind, or turquoise like pure water. For this reason, lots of the birds I draw are blue. They are the blue voice of the sky. When did you first read or hear Saint John XXIII’s 10 rules for “Just for Today”? Why did it leave a lasting impression on you? I didn’t know the 10 rules for “Just for Today” at first. Before I started this book, I was searching for a prayer, something simple to understand, but at the same time proven and wise to make children (and me!) wiser about the sacredness of life. When I read it I fell in love with it immediately! These words are for any human being, not just for “children” or “adults.” These words talk directly to the heart and soul. It was a big challenge to draw something at this depth and this height. Learn more about Bimba Landmann on her website, and click here to order Just for Today.